St Lawrence University's Vice Chancellor, Professor Kashim Ibrahim Tala, retired from the University of Buea as Emeritus Professor of Literature and Ecoculture after serving for close to forty years in Cameroon's higher education. He is a highly accomplished scholar and researcher in Literature, African Orature, Popular Culture and Ecoculture and a frequent opinion leader on higher education issues in Cameroon. Serving as SLU’s Vice Chancellor gives Professor Tala an opportunity to put to positive use the world of expertise and experience gained as a graduate/professional student in the United Kingdom, a Postdoctoral research scholar in the United States and several years of service in different capacities at various State Universities in Cameroon. Professor Tala is the first Cameroonian to earn a PhD in Cameroon under the tutelage of the revered Professor Bernard N. Fonlon. He studied Higher Education Management in the United Kingdom and later carried out Postdoctoral research/teaching at Pen State University in the United States. Throughout his career, Professor Tala also served in a variety of teaching, research and administrative positions. He served as Head of Department of African Literature and Civilizations at the University of Yaounde 1, as Technical Adviser at the University of Dschang. He was also Secretary of Buea University Centre and Director of Centre for African Literature and Cultures. He is also a Visiting Professor at the University of Yaounde 1, the University of Dschang, and the University of Bamenda. Prof Tala was the first Secretary General of the University of Buea from where he retired as Emeritus Professor. As a scholar and researcher, he has chaired more than a dozen PhD Thesis Committees in various Universities in Cameroon, and has served on the Scientific/Editorial boards of several national and international journals including: Journal of Educational Assessment in Africa, Epasa Moto: Multidisciplinary Journal of Arts and the Humanities, JELLiC: Journal of English Language, Literature and Culture, Intersections: International Journal of English and Literature Studies, Annals of the Faculty of Arts, Letters and Social Sciences and Cameroon Journal of Studies in the Commonwealth. He has published several articles in national and international journals and has nine (9) books to his credit: Introduction to Orature: A Research Guide, Orature in Africa, An Introduction to Cameroon Oral Literature, The Oral Tale in Africa, Demystifying African Myths, Introduction to the Cameroon Novel, Power and Marginality in Cameroon Popular Culture, Language and Literature: Interdisciplinary Perspective (ed. et al). Among his many honors and awards is the creation of the Kashim Ibrahim Tala Annual Lecture in recognition of his contribution to the development of higher education in Cameroon. He was elected a Fellow and Honourary Member of the Cameroon English Language and Literature Association 2012. 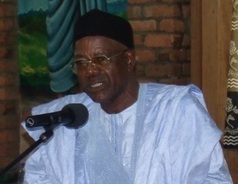 Professor Tala hails from the North West Region of Cameroon.